Consumer confidence fell unexpectedly in September to a four-month low. This was the sharpest monthly drop in sentiment since October 2013 after the 16-day government shutdown. According to the Conference Board, consumers are growing more pessimistic over the deteriorating labor market. 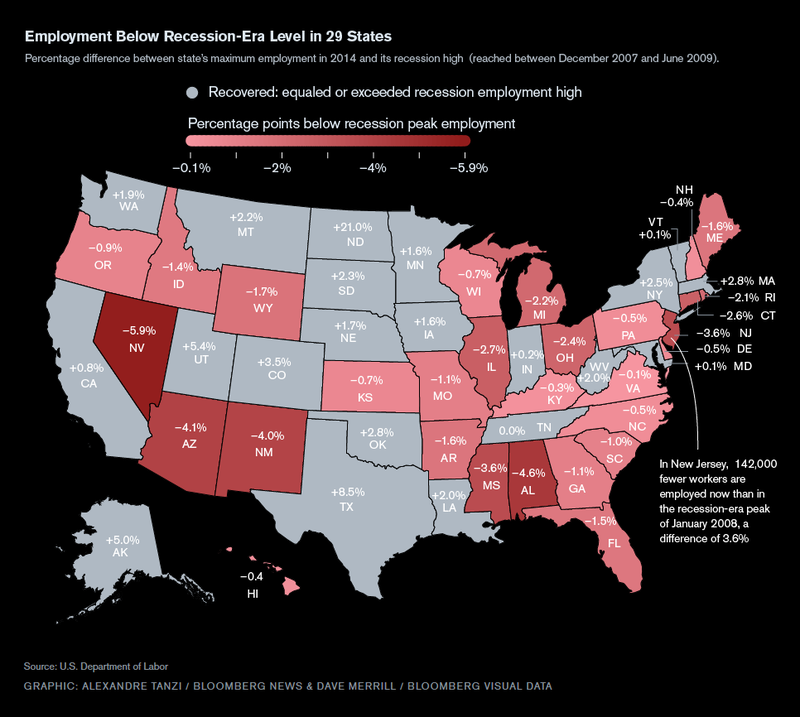 This morning Bloomberg News posted a timely graphic of employment levels in each state compared to the 2007-2009 recession peak. Here in Vermont, we’ve apparently “recovered” with 0.1% more jobs, but a couple of weeks ago the Bureau of Labor Statistics reported that in August the state’s unemployment rate rose by 0.4%, the third straight monthly increase. The number of Vermonters out of work and seeking employment is now higher than at any point in 2014. According to the Labor Department the top three states with “statistically significant” increases in August: South Carolina (+0.6%), Vermont (+0.4%), and Georgia (+0.4%).